Molecular imaging market has grown manifold during the course of time, primarily due to increasing demand for detection and monitoring of disease such as cancer and other rare genetic disorders. 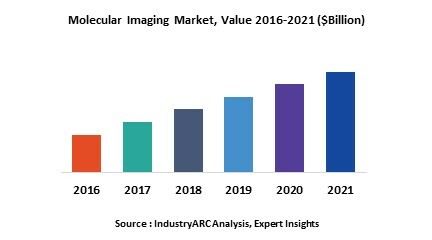 Globally, aging population, the adoption and advancement in technologies such as PET/CT, non-ionizing imaging techniques and growing demand for efficient and accurate imaging system are the prime growth drivers of molecular Imaging market. In addition, Increase in adoption of Molecular Imaging for newer applications, and emerging economies such as China, India and others, will create new opportunities for molecular imaging market. However, higher cost of the research and development, and continuous improvement and innovation in molecular imaging technologies are the key restraints for molecular imaging market. Geographically USA dominated global Molecular Imaging market, and is projected to have fastest growth, owing to high prevalence of the disorder, technological advancements and high awareness among the patient population. Europe was observed to be the second largest market and one of the leading research destinations for neurological disease diagnosis and treatment. Asia-Pacific and Rest of the World were observed to be the most potential markets for Molecular Imaging diagnosis and treatment market. This report identifies the Molecular Imaging market size in for the year 2014-2016, and forecast of the same for year 2021. It also highlights the market drivers, restraints, growth indicators, challenges, and other key aspects with respect to Global molecular Imaging market.